“Naughty But Nice” is a stone sculpture inspired by my husband Brian’s cat, Kittywinks. 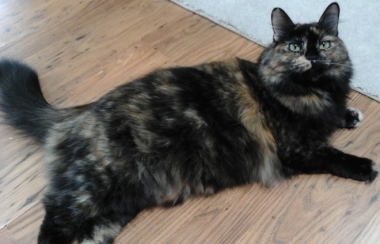 She is a longhaired tortoise-shell cat with a big personality and a remarkable story. Six years ago some hikers discovered a demolished nest of feral kittens. A predator had attacked leaving one survivor, a ten-day-old ball of fluff with a maggot-infested wound in her leg. The hikers took the orphan kitten to our vet, Dr. Corrine Thomas, at For the Love of Cats Veterinary Clinic here in Loveland. Of course Dr. Thomas took her in, treated her wound, and nursed her through 6 feedings per day for 6 weeks–one meal every four hours night and day. 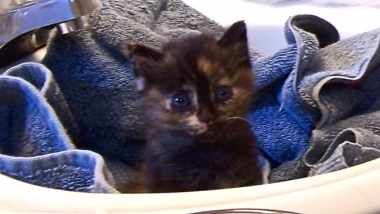 A family volunteered to adopt the kitten but changed their minds at the last minute. Brian was the first person on the wait list, and brought home the ball of fluff, who fit perfectly in the palm of his hand. Now Kittywinks has Brian in the palm of her hand/paw. 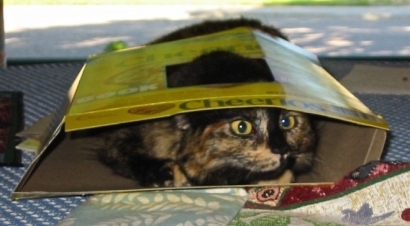 She is (to date) our smartest, silliest, and most opinionated cat. When Brian arrives home he makes a beeline for his office, usually with his hands full of stuff. Kittywinks races to meet him at the door, runs ahead of him and flops on the floor showing her tummy. Brian steps over her, so she jumps up, races ahead of him and flops for another tummy-rub. This may happen once more before Brian reaches his office, unloads all his stuff on the desk, and finally awards the desired tummy-rub. Flopping and rolling happens many times during the day whenever Brian and I walk through the house. Tummy-rubs are requested and administered at each of our destinations, and often en route. She is persistent, and the tummy must be acknowledged. Kittywinks taught Brian how to throw a soft bouncy ball down the stairs so she could run down and bring it back up to him—usually ending with a flop. Brian taught Winkies how to jump up on the bathroom counter to have her teeth brushed. She really loves chicken-flavored toothpaste. Winkies hisses and spits at Dr. Thomas when she goes to the vet, the one person who saved her from oblivion. Counseling does no good. Cats have their own reasons that we simply cannot understand. The kitchen counter is just about the only no-cat zone in our house. Kittywinks understands “No!” Yet, she selectively disregards that reprimand when lounging on the counter. If pressed, she makes herself as tiny as possible (quite an accomplishment for a 14 pound cat) perched on a corner ledge. I believe she thinks we are upset that she is taking up too much counter space. At times, Winkies has the most mischievous trot. She tucks her head and tail to the floor with her big fluffy body mounding up in the middle, and looks exactly like a tiptoeing haystack. (I do not think she learned this from watching cartoons, but maybe.) This maneuver has guilt written all over it. I don’t know what she has done, but it can’t be good. Portoro Marble is the most difficult stone I carve. It is unreliable and can have gaps between the colored vein and the black matrix. It is chippy, a grind-only stone that will fall apart if one uses percussive tools. 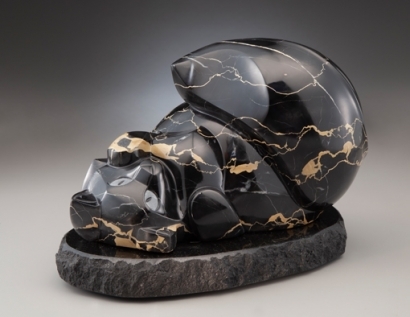 The unfinished sculpture must be bathed in low viscosity super glue after each day of carving—an effort to keep the stone from falling apart during the next day of carving. The finish, which is just as demanding and time-consuming as the carving, is achieved using a poisonous paste made from tin oxide and oxalic acid. So why do I carve this stone? Simple. I love a challenge, and the reward is gorgeous! After the creation process is finished, the stone is irresistible, and I fall in love with the look and feel of it all over again. The first time I carved Portoro was to make “The Uptown Skunk.” I vowed after that experience I would never carve this marble again. “Naughty But Nice” is the fourth sculpture I have made from Portoro . . . and I know there will be more. I know our cat, Kittywinks, is naughty. But, somehow, mostly what I remember are the nice things. Perhaps cats have a talent for manipulating their people to selectively forget the bad times. Maybe that is why we love them and pamper them. They have access to dimensions we cannot imagine, but we benefit from their insight. The breakfast table is not a no-cat zone.